I've been seeing tons of woodpeckers in my trees and yard this spring. So far I think I've seen three different types, but I haven't had a chance to look them all up yet. They're surprisingly tame and come very close when I'm working outside, but this guy was the most surprising so far. 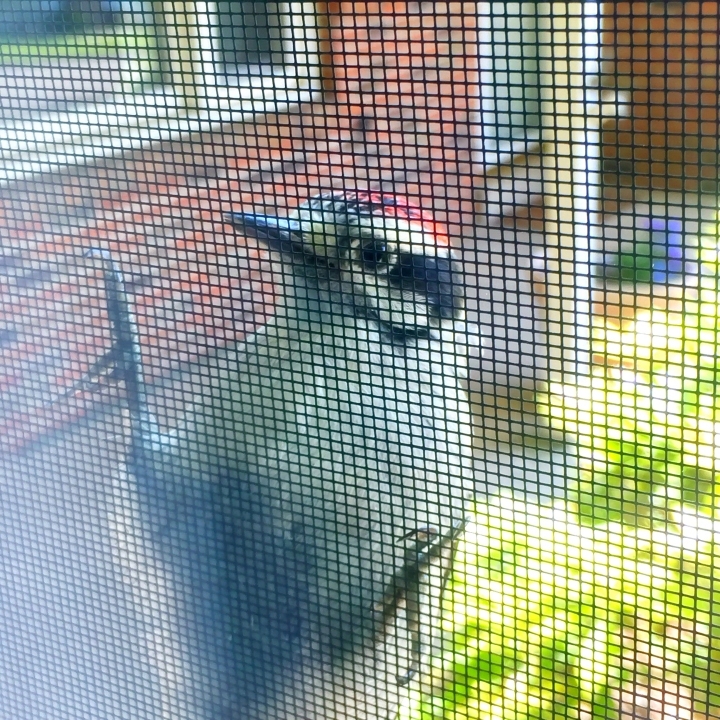 I noticed him from another window - the large window in the background - where I saw him clinging to this window screen. 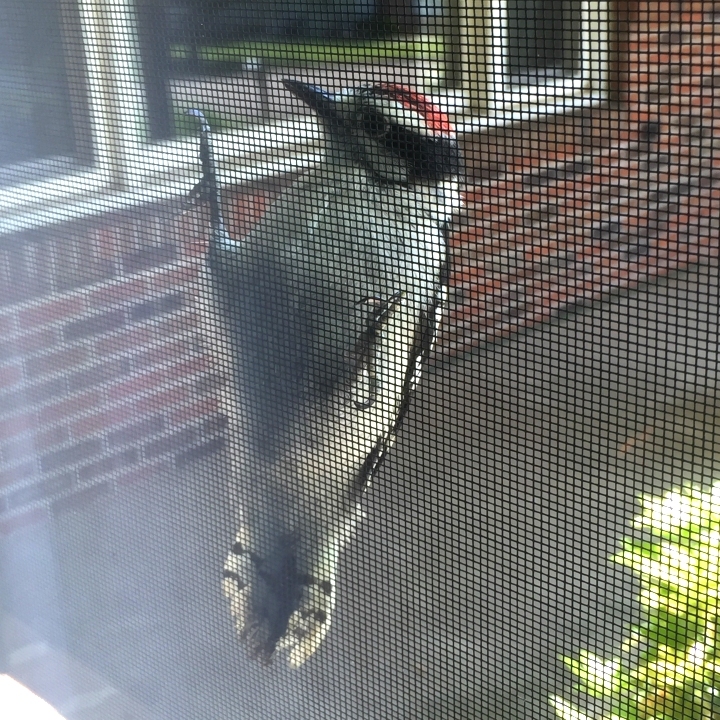 After watching him a few minutes I thought I'd take a closer look and see if I could check him out from the other side of the window that he was clinging to, but I figured he would probably fly away when he saw me. He didn't. I watched him for a few minutes and he just sat there - then I realized why. My daughter was in that room playing her electric bass guitar, and she had it turned up pretty loud. So loud, that it made the room and windows vibrate. And that's what attracted this young woodpecker - the vibrations! It turned out that woodpeckers have an amazing sense of hearing and they often find their food (mostly insects & larvae from trees and from inside cracks and pieces of bark on trees) from the sounds and vibrations that the insects make. Ha! So this guy was most likely attracted to my house by the vibrations of my daughter's guitar playing. I actually made a video of him sitting here on the window screen listening to her play - and you can hear her playing in the background - and once I get it up on my YouTube channel I will add the video to this blog post. Wonderful! I love seeing all the birds in our yard. 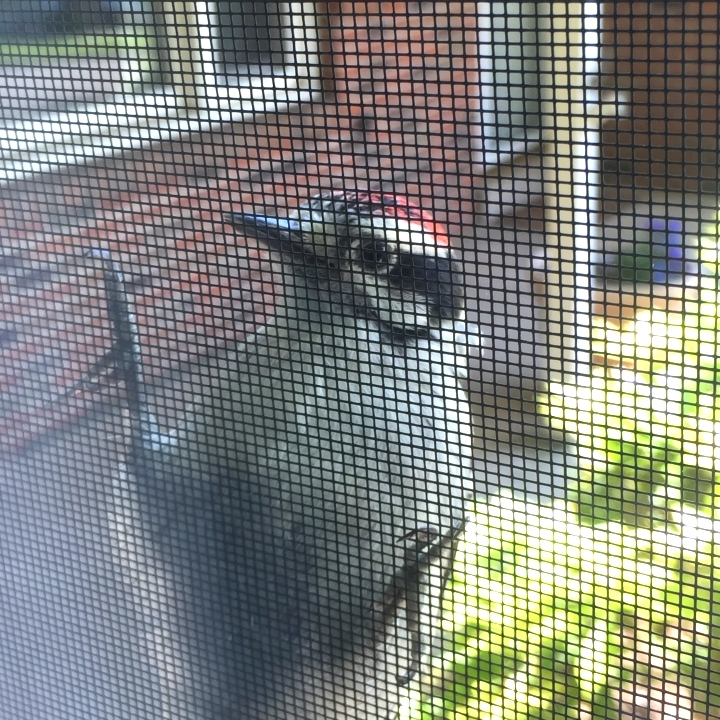 We had a woodpecker drilling into our house a couple of times. We have vinyl siding!!! I hope he or she doesn't hear anything bad. That was really funny hearing a woodpecker pecking at our house! I'm glad you were able to capture this little guy with your camera. We enjoy many birds here in southeastern NC: blue birds, blue jays, cardinals, tufted titmouse, mourning doves, humming birds, chickadees, red-wing black birds, sparrows, Chuck Will's Widow (a night-calling bird), owls and the woodpecker. We provide food, nesting boxes and a birdbath, and the wildlife provides hours of entertainment for us and our kitties. Aww, he might have thought your house was the insect larvae restaurant, with large, noisy grubs making their movements known. Aren't birds just fantastic? We had hairy and downy and pileated woodpeckers in our yard, when I lived in the country. I believe that is a downy woodpecker, the smallest one in the U.S. The pileated are huge and when they are pecking on a tree, it is an amazing site. The chips fly and very quickly. I really miss seeing them. I like to think that we still have dinosaurs in our yards, isn't that the coolest? They are awesome. I've also been seeing a huge brownish-tan one in my front yard; has a read beak and is really big. He hops up and down my walkway, going after the little ant mounds. I say, go at it! Thats a great picture and story to go with it!!!! I keep trying to capture pictures of the blue jays in my yard but havent been able to get close enough yet.....hopefully soon!!! I love the blues too - we have those and lots of cardinals, who are much more noisy and seem kind of territorial. I see them bully the smaller birds from my feeders! Re: woodpeckers… it may have been vibrations, but the woodpeckers in my neighborhood come to greet me because I often give them peanuts. It's possible someone had been feeding your woodies and they associate humans and their noises with treats. I buy and feed peanuts unsalted, in the shell, at Costco. No one [including squirrels and jays] can get piggy by taking too many at once. I'd say that peanuts are definitely a way to get their attention! Do you put them in a feeder or just scatter them around?